Polling places are open from 8:00 a.m. - 8:00 p.m.
Vote at your regular polling location. Click here for more information. The City of Driggs Election will elect two Council Members and a Mayor to serve four-year terms, and one Council Member to serve a two-year term. The City of Tetonia Election will elect two Council Members to four-year terms, and one Council Member to serve a two-year term. The City of Victor will elect two Council Members to serve four-year terms. You must be a resident of the respective cities to be eligible to vote that City’s Ballot. Teton County Fire Protection District Election will elect one Commissioner to serve a four-year term. Teton School District 401 Special Bond Election will have two bond questions. 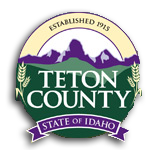 All eligible county residents may vote the Teton Fire Protection and Teton School District 401 Bond Ballot. You can request a ballot be mailed to you by completing an Absentee Request form. Click here for the form. That last day to request that a ballot be mailed to you is Oct. 27. Or beginning Oct. 10 you may vote In-person Absentee at the Courthouse during regular business hours, Monday - Friday 9:00a.m. - 5:00p.m. The last day to vote In-person Absentee is Nov. 3. Click here for the City of Driggs sample ballot. Click here for the City of Tetonia sample ballot. Click here for the City of Victor sample ballot. Click here for the Fire District and School Bond sample ballot.